Smother Goose: Nickelodeon short: "Fast Food"
When I was little, I never tried a shamrock shake or lime Kool-aid, and a green congealed salad? Forget it. 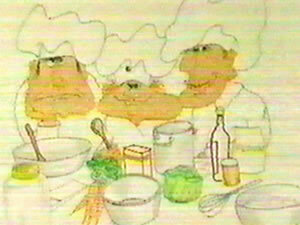 That's because this innocuous little cartoon taught me that green food coloring comes from live frogs. The premise of the short is basically Iron Chef: Frog Edition. It's St. Patrick's Day, so the three competing chefs must each make a green-colored dish using the frog provided. The frog, for his part, makes futile pleas for help from his bell jar prison. There is a pause in the action and we see a very red parrot looking quite worried. "Uh oh," it says. "Polly wants a cracker. Polly does not want to be a cracker." We are only left to speculate about the poor bird's fate after the credits. Red velvet cake may contain trace amounts of scarlet macaw. I remember this cartoon well! Once you see it, you will not likely to forget it, no matter how hard you try. Does anyone remember explicit language or word that was said at the very end of the credits on this video? It sounded like someone said something at the very end.